By popular vote, Patricia Clayton Deckert (pictured left), a resident of The Buckingham in Houston, has been named our 2016-2017 Inspirational Senior Texan. Congratulations to Patricia & all at The Buckingham on this prestigious honor. In May, Patricia will be presented with an award at the Opening General Session of our 2017 Annual Conference in Austin - make plans to come join us in celebrating her! When I had to think of someone to nominate out of all the wonderful residents here at The Buckingham Senior Living, Patricia (Pat) Deckert was the first person to come to mind. She represents a resident that gives back to our community but contributes outside and has been for many years. Pat's Story, when I met in 2005, she was a book worm in the community always in our Library. Working with other residents to transform it from the designer books from when we opened to a real library. A place where residents could come and read, partake in puzzle, or just relax outside of their apartment. 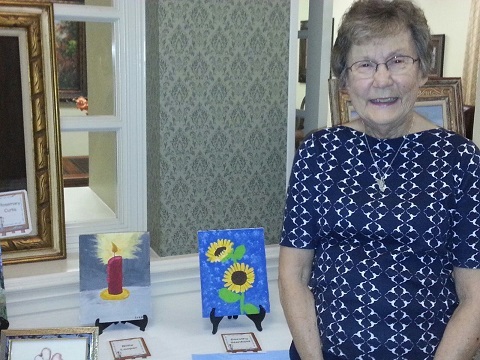 Pat, however, has been giving back for many years, for the past 26 years she has been a volunteer at Houston Methodist hospital and a leader in the volunteer group and trains new volunteers. For 20 plus years volunteer as the House Manager at A.D Players Theatre (a place we frequent with our residents). She is very active with her Church on a programs such as PMPal to special needs children & siblings, Chair of Docent Tours, Leads sandwich making team for Kids meals and serves on the Board of Stewards and the help with the Newsletter for 400 Sunday school class members, communicates for the women circle. She also helps with the Houston Women's Shelters in gathering donations for Dress for Success program. When new residents are downsizing she will gather all the clothes that didn't fit in the closet and take them to a shelter or program in need. If I do not know what to do with an item I always refer residents to Pat she can find organizations that can use the items. In her spare time her at the community, she is an important part of The Buckingham's daily living, she tends to the Library daily making sure it is always neat and ready, she serves on the resident council, conducting election process and chairing the Employee appreciation fund, she is a floor representative and welcomes new residents into the community, also creates and provides weekly activity updates for those residents. We are a Masterpiece Living community and Pat is one of our champions, who helps in creating purposeful programming for the residents along with the community directors. Together we are working on increasing knowledge on volunteering for those new residents, who are new to Houston but want to volunteer. In doing so we have been able to find places for these residents to volunteer in and out of the community. In lifestyles she volunteers many hours working with me on our monthly newsletter and writes an article each month called "In and Out of the Library", which gives the residents updates about new books or good reads in our Library. She is our go to proof reader, hence I did not use her for this as may notice. This seems like it is just a list without great detail and probably leaving some things out, but I can tell you The Buckingham and I are lucky to have her here in our community. She always finds time to share her knowledge. Pat gives back to the residents on a daily basis. She is truly an "Inspirational Senior" for she inspires me every day. Ms. Rochelle's inspirational character shines ever so brightly at The Wesleyan. With a kind smile and encouraging words, she warmly greets every new resident, making sure they're settled-in and comfortable in their new home. Since 2011, Ms. Rochelle has single-handedly kept our large Wesleyan library alphabetized, organized and tidy. "Library Time with Rochelle" is one of the residents' favorite monthly activities. Between California, England, Austin and Georgetown, Ms. Rochelle has been gently caring for books, and those that love them, for over 30 years. How truly fortunate and grateful we are that she continues to share her specials gifts and talents. Ms. Rochelle is a true educator. She was a favorite teacher for nearly three decades in Austin, and even continued her teaching while living in England. Upon returning to Austin, Ms. Rochelle continued her love of teaching curious 1st graders. She continues to enthusiastically educate and intrigue all her Wesleyan friends with fun science and nature experiments. Most recently, our lobby was a butterfly nursery and we had the opportunity to witness the miraculous metamorphosis of tiny caterpillars to magnificent Monarch butterflies. Guess who was the inspiration for our beautiful, blooming butterfly garden and courtyard? Ms. Rochelle has many hobbies, ranging from reading to geology and collecting artifacts- each with a story to tell. At first glance, one can't see the amazing story behind a simple rock, but she knows the history of each etching, arrowhead, fossil, rock, gem and mineral in her impressive collection. Ms. Rochelle and her grandfather shared this passion and she has many fond memories of the times they spent together. Ms. Rochelle shares that living at The Wesleyan is like living with family and she wouldn't trade it for the world. The feeling is mutual. She's our beautiful butterfly, our solid rock and our shiny gem. Billie Looper generously gives her time, energy and money to Christian Care. She moved here after her husband died. Ms. Looper is an unstoppable force of energy, spreading an infectious positive attitude wherever she goes. She has been a devoted and committed resident of ours for three years. In true Texas spirit, Ms. Looper is always alert to what her fellow residents in the community need. She volunteers her time to many of them by taking them to the doctor, store or wherever they need to go. She visits her fellow friends from Christian Care in the hospital and makes them laugh when they need some joy. About a year ago, she and her boyfriend started the "Night Critters" group. This group of friends(anyone is welcome) gather every night around 7 pm in the atrium. They bring their laptops and discuss current events and fun things. If they don't know what a word or phrase means, they look it up on the lap top. It's a reminder of days gone by, when cowboys would gather round the campfire and discuss what was on their minds. Ms. Billie is a true inspiration for her Texas style of Leadership and go get 'em attitude! She's a True Inspirational Texan! Click here to view all the nominations for the 2016-2017 Contest. Thank you to all those who nominated & voted!